In the late 19th century and first half of the 20th century, several investigators noted the tremendous vascularity of ovarian follicles and corpora lutea and recognized the importance of the ovarian vasculature in supporting growth and development of these tissues. In his classic treatise, Clark  evaluated vascular development of the human ovary from the fetal stage through senescence and provided us with the first clear picture of the vascular architecture of the various ovarian tissues. After evaluating vascular anatomy throughout follicular development, Clark concluded, "the vital impulse to growth in the theca interna depends not upon a maintenance of its primitive blood supply, but upon a decided increase of that supply." More recent studies have confirmed that dominant follicles (that is, growing follicles that go on to ovulate rather than regressing) have not only a more vascular theca but also an increased uptake of serum gonadotropins compared with other antral follicles, implying that they also have increased blood flow compared with other follicles. Thus, increased vascularity may be a primary determinant of follicular dominance. These early investigators also observed the heterogeneity in follicular vascularization and suggested its importance in determining whether follicles remain healthy or become atretic. Subsequent work has supported this contention that maintenance of the follicular vasculature is important for maintaining follicular health. For example, Moor and coworkers (summarized in Ref. ) observed that early atretic ovine follicles will regenerate when placed in vitro, and suggested that decreased vascularity may limit access of atretic follicles to nutrients, substrates, and tropic hormones in vivo. More recently, Greenwald  found that reduced DNA synthesis of follicular endothelial cells was associated with reduced follicular vascularity and was one of the earliest signs of atresia. Similarly, we have observed that cessation of thecal endothelial cell proliferation, associated with a decrease in thecal vascularity, is an early event associated with atresia in bovine, ovine, and porcine follicles. weight-specific rates of blood flow of any known tissue but also has an extremely high rate of oxygen consumption. Ovarian blood flow and microvascular perfusion are highly correlated with progesterone secretion, which emphasizes their importance for normal luteal function, just as microvascular perfusion may be a critical factor in determining which ovarian follicles become preovulatory and acquire the ability to produce and secrete estrogens. Conversely, inadequate luteal function has been associated with decreased luteal vascularization. Several investigators have suggested that reduced ovarian blood flow also plays a critical and active role in normal luteal regression. It is interesting to note that during luteal regression, although a portion of the capillary bed regresses, some of it remains intact and apparently functional throughout regression. This is thought to be important because the corpus luteum does not regress by necrosis but rather regresses in an orderly fashion such that the luteal tissue is resorbed within just a few days or weeks. The ovarian follicle and corpus luteum are relatively unique not only because they are so vascular and have such high rates of blood flow but also because of the composition of their microvasculature. For example, in the several parenchymal lobules of the mature corpus luteum, which constitute the bulk of luteal volume, the vast majority of the microvessels are blood or lymphatic capillaries, with arterioles and venules only rarely observed (Figure 3). This observation, along with physiological studies, has led to the suggestion that the luteal microvasculature comprises a "sluice flow," or relatively unregulated, system, and that blood flow is therefore regulated acutely by vasoconstriction or vasodilation of ovarian vessels external to the corpus luteum itself. This appears to be at least partially correct, but acute regulation of regional blood flow probably also occurs within the corpus luteum via intraluteal arterioles and venules that are present in the connective tissue tracts between the parenchymal lobules (Figure 3). Additionally, Niswender and colleagues (see the chapter by Ellinwood et al. in The Vertebrate Ovary, which is listed under Further Reading) have demonstrated substantial regional heterogeneity of luteal blood flow distribution. 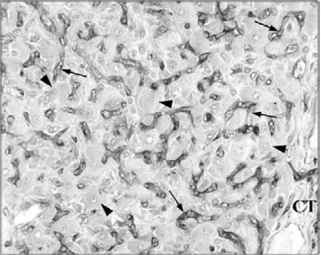 Consistent with the relative lack of vasoactivity, the microvessels of the luteal parenchymal lobules do not appear to be innervated. In the follicle, nerve fibers are not present in the avascular follicular granulosa layer, whereas the arterioles and venules of both the theca interna and theca externa are densely innervated and respond to adrenergic agents. Similarly, luteal blood flow is highly responsive to adrenergic agents. In fact, ovarian blood flow is regulated primarily by periarterial sympathetic vasoconstrictor innervation within the follicular and luteal arterioles (see Ford, 1982, which is listed under Further Reading). 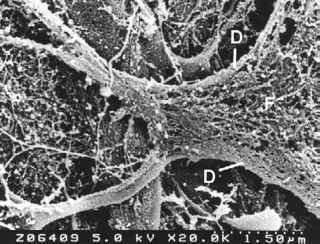 In addition to being composed mostly of capillaries, the microvasculature of the theca interna and corpus luteum contains a large proportion of capillary pericytes. For example, Redmer and coworkers  have recently found that the endothelial cell: pericyte ratio in the corpus luteum is approximately 1:1. In addition, although the number of lymphatic capillaries has not been quantified, the corpus luteum and ovarian follicles have an extensive lymphatic system and a relatively high rate of lymph flow per unit of tissue mass (up to 1% of blood flow), which probably reflects their high rates of tissue perfusion and blood flow. The microvasculature of the ovarian follicle and corpus luteum also is relatively unique in that it is highly permeable. This high permeability is not surprising because of the highly fenestrated nature of the capillaries, especially in preovulatory follicles and mature corpora lutea. For example, both ferritin (molecular weight 462 kDa) and albumin (molecular weight approximately 66 kDa) readily pass through the capillaries into the interstitial fluid. A relatively high level of plasma protein in the ovarian lymphatic drainage reflects this high permeability. In fact, the ovarian lymphatic drainage transports up to one-thousandfold more protein per day, on a tissue weight specific basis, than the lymphatic drainage of the hindlimbs.